Compass Auctions will host an ONLINE ONLY auction event on February 13, 2019. 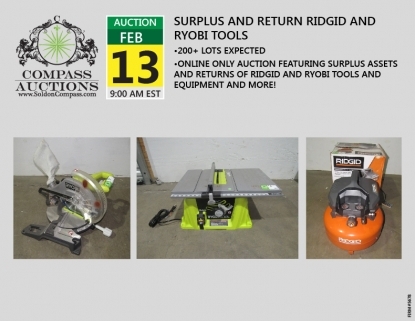 This auction will have a 9am EST start time and will offer 200+ lots of quality surplus and return Ridgid and Ryobi tools and equipment and more! Don’t miss this chance to purchase brand name merchandise at auction. For additional photos, catalog of items, terms & conditions of the auction and to REGISTER to bid, visit the online catalog.